Ciaran Kennedy BScEng(Hons), DipStructEng, MIStructE, MIEI,CEng, FConsEI Chartered Engineer, Managing Director of Barrett Mahony Consulting Engineers (BMCE), was elected ACEI President at the ACEI’s AGM on 6 April 2018. 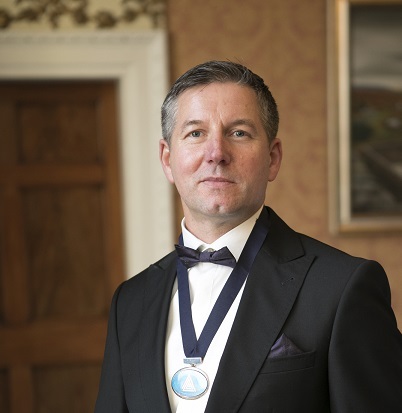 He is honoured to be chosen to represent the association and its members and looks forward to dealing with both the challenges and opportunities that are presented over the course of the year. Ciaran was first elected as a member of the ACEI Executive in 2007 and has served on the Executive Board under many esteemed presidents over the past decade in a variety of roles including: convenor of the Structures committee; convenor of the CPD Committee; Honorary Secretary, second Vice-President and Vice-President. He has also maintained active involvement in the Structures Committee of the ACEI since 2002, keeping him abreast of technical developments in the construction industry which has seen recent fundamental changes in procedures, legislation and regulations. Ciaran is a chartered structural engineer and since early 2016, MD of BMCE, an award winning civil and structural engineering consultancy with offices in Dublin and London. Previously he held roles of project engineer and project director in BMCE. Ciaran graduated from DIT Bolton Street in 1996 with a first class honours degree in structural engineering and began his career as a design engineer in a site based role, gaining particular experience in refurbishment and the interaction of new build with heritage buildings. In 2000 he achieved chartered engineering status with Engineers Ireland and the Institution of Structural Engineers. An innovative, creative engineer and problem solver with a strong work ethic, pushing the boundaries of design whilst respecting the appropriate limitations, Ciaran has demonstrated strong collaboration ability with natural communication skills. Technical skills and experience include a broad range of structural types and forms including commercial, retail, residential, healthcare and education utilising a full spectrum of construction materials.